It is normal view of young couple holding hands, kissing in park, hugging. 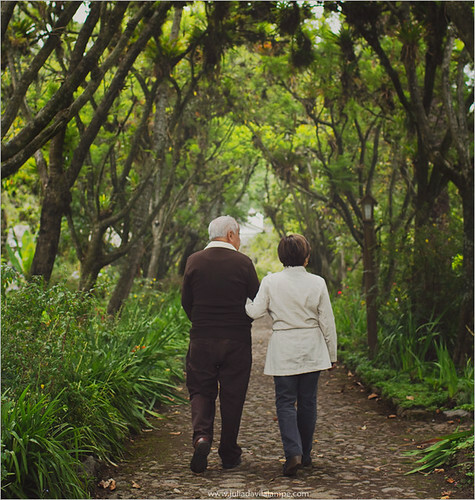 This view is very common, isn’t very popular to see often older people walking together holding hands – why? A lot of older people are alone. The reason for their loneliness are: life partner’s death, being left, or divorced. People often think that falling in love in elderly is not possible. The truth is different. The ages do not have any influence for love to another person. Everybody of us needs to love and to feel that is loved. Some couples can spend all life together and that’s great, but unfortunately some people are unfortunate and they end up alone. Some people are of the opinion that older people do not need partner in elderly and even that it is unusual to look for love “in their age”, that they have grandchildren and should focus on them. Do they have to be alone? No, they should not be alone. There are ways to meet person who they can love again. Even they have kids, families they need partner. Kids have own life and can’t spend with parent all the free time. Grandmas and grandpas might spend time with grandchildren sometimes, afternoon and later still they are alone in the evenings. Internet- now the Internet is very common, lots of older people learn to use computer from grandchildren. They know to write email, to call on skype, read the news, play games on facebook, so they can also use the Internet as source to meet mature people. Social Clubs- if somebody does not like Internet, can find in close area some social club for older people. Lots of towns have clubs like this, organize free time, play chess, cards, scrabble. The love is not only for young people. Everybody deserve to love and be loved. It is good to open for new people, to not give up and to not agree to spend life alone. Love is the most beautiful feeling and does not know about ages, even in elderly people can appreciate more the richness of love, because of huge life experience. Martha is seniors health and wellbeing writer, loves to help people understand and accept mature ages. She found her husband on maturedating.com where you can register now.